Well, Stan, I guess your wish is coming true. Your high-powered St. Louis Rams football team is now 0-3 on the pre-season and the big St. Louis debut of Nick Foles and company packed in a whopping 37,000 fans into the Ed who apparently had nothing else to do on a Saturday night in St. Louis since the Redbirds were on the coast. We’re season ticket holders but we opted out, choosing instead to go out to dinner with friends and when I checked the score right around dessert time, I knew we had made the right decision. 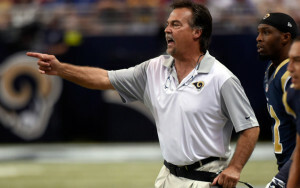 I’m sure Jeff Fisher will say there’s nothing to worry about. And from Jeff’s point-of-view, he’s probably right – Stan’s going to pay him anyway whether they go 2-14 or somehow manage to shock the world and finish maybe 9-7, posting the Rams first winning record since 2003. “Well, we’ve got a few penalties to clean up and need to stick to our routes a little better,” or something along those lines will be stated by Jeff. “We can fix that.” Then they’ll get ready for the big Governor’s Cup Showdown this Thursday night against the Chiefs. And drop the ball … again. Nick Foles did manage to go 10 of 11 which is excellent but it amounted to a whopping 123 yards and led to one touchdown. Go crazy, folks, go crazy. I’m sure this Thursday evening, downtown St. Louis will be buzzing with excitement, tailgaters everywhere, spilling over into Laclede’s Landing and lining the streets of Washington Avenue with Rams and Chiefs fans both before and after the game. And since the Cardinals have an off day on Thursday night, the echoes you hear as you scream out loud, “Stan, what have you done?” will bounce off the walls of an empty downtown. It’s going to be a very long season. I’m not quite ready to go the route of wearing a sack over my head – that’s too much effort. But I am expecting a partially-filled Edward Jones Dome that will only grow worse as the season rolls on as the Rams stumble and bumble and fumble their way to L.A.
And as attendance dwindles and the season fizzles, the NFL will come out and say that the fans of St. Louis just don’t know how to support a professional football team. If only we had one. Big Idea Thinking is why I get up in the morning. That’s been the theme line of BloodLines Creative ever since I began this business and it’s true – they really do start here. Of course, I don’t have a monopoly on the creation of big ideas. They can come from anywhere and there are all sorts of agencies and design firms here in St. Louis and around the world that could say the same thing. Expand that to all sorts of businesses and companies and these days, you have to include the power of the individual to be a walking, talking think tank as well. So is this a unique selling proposition? Probably not. Still, ideas are what I sell and I truly believe in the power of the big idea – something that connects with the individuals you’re targeting. There are so many ways to connect with people these days. Which also means there are so many ways you can completely miss connecting with them. Tweets and posts come and go. Commercials are easily ignored or never even seen – completely tuned out or turned off because there is simply too much information. How do you cut through it all? You have to know your customer – more so now, than perhaps ever before. That’s no easy task, especially to clients that don’t have vast sums of money to spend. It takes big idea thinking. And it takes a client who is willing to take that flying leap of faith to do something out of the ordinary. I have been fortunate to be engaged with a wide assortment of clients who not only are expecting me to deliver big ideas, they are demanding it. I’ve been even more fortunate to continue working with some truly talented individuals who do amazing work and have joined forces with a brand new network of talent, not just here but across the pond in London as well. We’re all working as one to find innovative ways to get our client’s message out and in some cases, almost completely build their audience, as we seek to turn them from mere customers into brand advocates. So though the theme line of BloodLines Creative may not be the most original line ever crafted, it’s still on point. If your business or organization could benefit from some big idea thinking I offer two words of advice: start here. I was amazed when I searched images to find that this headline had been done about 500 times before. When I originally began this blog more than 300 posts and nearly 100,000 viewers ago, I was fired up and pronounced that I was ready to do great things. I’ve written about a wide variety of topics, focusing primarily on advertising and marketing communications which is how I earn my living. Yet the most readership I’ve gotten through the many posts I’ve done has generally not had anything to do with those topics. The potential merger of St. Louis city and county has drawn the most interest. That’s good, I guess. I remain a firm believer that there should be a merger, that the current divide is harming our region and that we’ll never really capitalize on our true potential unless we join forces to address the variety of issues that need to be dealt with and eliminate the needless bureaucracy, fiefdoms and petty politics that continue to put a slow stranglehold on this region. Other posts I’ve written that have drawn many views and elicited quite a few comments range from the glory days of Kenrick Advertising to the Rams leaving town to the loss of my dad this past December. I’ve tried to position myself as a thought leader in the wonderful world of advertising and marketing communications. But I’d be the first to admit that I’ve been playing catch-up to the ever-expanding digital and social media whirlwind that has hit traditional means of communications and knocked them down for a ten-count. Though I’ve made great strides in my knowledge base, new technologies and user platforms emerge on a daily basis. If you think you’re on top of something one day, you’re behind the next. But one thing remains unchanged no matter how it’s being delivered: the simple ability to communicate. These days, it’s more important than ever to develop your brand personality and connect with your audience in ways that are honest and true to what you’re all about. I have tried to assess the amount of business I’ve gotten through writing these blog posts. Directly, I know it led to one piece of business that has long since come and gone. But people know I’m out there. Those who have read these posts know that I am capable of putting together a sentence or two that somehow leads you from Point A to Point B though I have a strong tendency to take detours and on occasion, run directly into roadblocks. Business has been very good recently. I don’t think there’s any correlation to the work I’ve been doing and the blog posts I’ve been posting (or more recently, not posting). 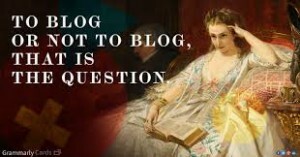 If you’re still reading, you’re the reason that the answer to the initial question is this: blog. Taking a vacation when you’re self-employed is no easy task. Not only are you leaving behind work-in-progress, you’re also foregoing any income that you could have been earning for those days away. It’s a weird kind of separation anxiety. When you’re working all those extra hours, you certainly deserve a break. And recently, my day shifts have turned into night shifts – which is a great problem to have – to a degree. Back when I was employed by others, I never gave much thought to the work I left behind – because I knew it would be there when I got back. But now that I’m back out on my own and trying to establish an on-going list of working relationships, I was hesitant to leave with quite a few balls up in the air. But leave I did as our whole family headed out for a trip to Aspen, Colorado, for the wedding of my nephew and his beautiful bride and my future niece-in-law. We left early on a Thursday morning – 4:30 a.m. definitely being early. Still, I thought I had time to get out one quick email before I was summoned out the door. Didn’t happen. I finished the reply upon arrival at the airport and then shut the phone down until we were in Denver, headed out for a 4-hour drive to Aspen. I scanned a few more emails, replied to a few others and did my best to keep my phone in my pocket. The rest of the day, I took in the sights and sounds of downtown Aspen and thoroughly enjoyed some genuine family time. Friday morning came and there was a nice, notable absence of emails. The wedding was scheduled for 11 am on top of a mountain that you reach by taking a 16-minute gondola ride to the top. This was a totally new experience, not just for me, but the entire family. Work could wait. This was simply too gorgeous to miss or even allow glimpses of work to creep through via my phone. It stayed off. Once the ceremony was done and the picture taking complete, the reception kicked in and it was a grand time. Lots of visiting, lots of new-found friends and catching up with my sister and her now rather large, extended family. I took one brief break to check for recent updates and there were quite a few – but none that needed immediate attention. By the time we were down off the mountain, the workday was essentially done and the weekend had begun. I could officially leave work behind – until I returned home, of course, and got caught up with a little Sunday night session. It’s great to be busy and I’m grateful for each new work relationship that I’ve developed over the past two months. I look forward to diving back in and giving my best each day. And I also look forward to my next vacation. Hopefully, I’ll get to the point where I can leave the emails behind, if just for a few days. They’ll be waiting for me when I get back.